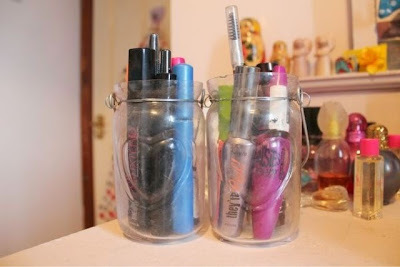 Today I thought it would be a lovely idea to share with you how I store my makeup. This is such a long overdue post, it's actually silly, but I wanted to wait until I had a space I was completely happy with before I shared it with you. 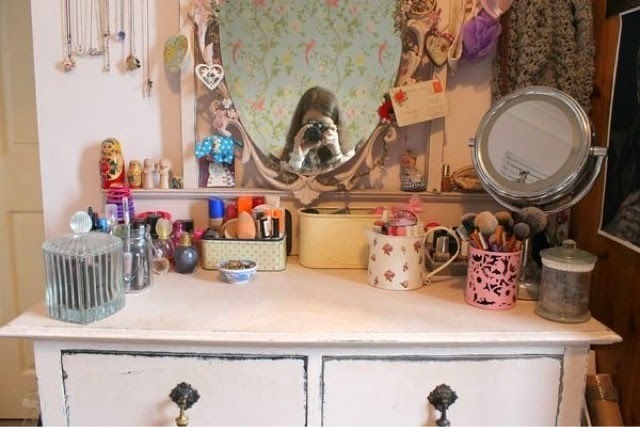 This is the overall layout of my dressing table. 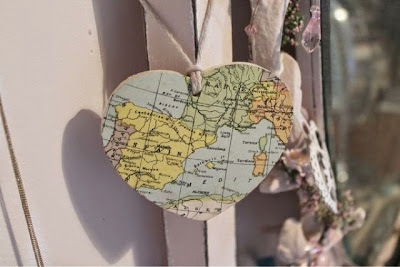 I purchased it a year or so ago on ebay from a company who buy vintage furniture, do it up in a shabby chic style and sell it on again, and it really was love at first sight. It has three drawers (one for skincare, one for haircare and a larger one for all the beauty bits and bobs I have no other place for) but I think this post is going to focus on what's actually on the top of the dresser, as that's where I store my makeup. 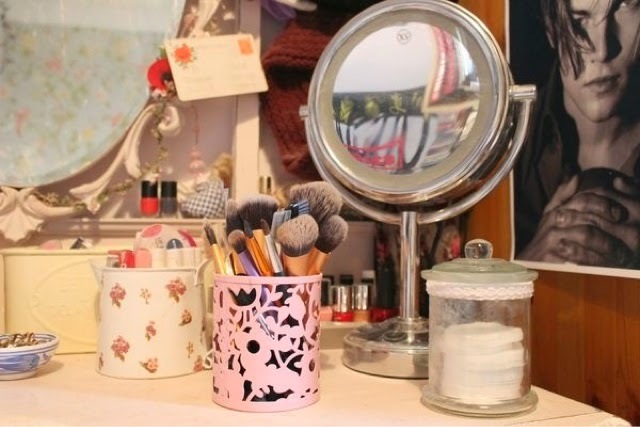 If you fancy seeing another post where I share with you how I store everything else in my dressing table, let me know and I'll give it a go. I realise that at first glance it does appear quite cluttered but that's just down to the fact that I choose to have a variety of pots, jars and tins to store my makeup in rather than the typical beauty blogger drawers that store everything in one place. I just think it makes it a bit more original and quirky having it all stored in this way. But it is much more organised than it all looks, I promise. On the far right side of my dresser I have my No7 Illuminated Make-up Mirror. 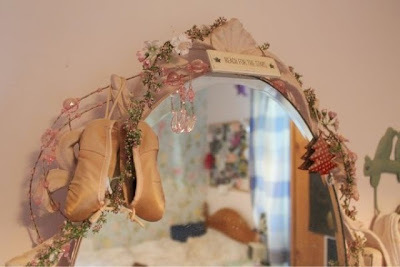 This is the most perfect makeup mirror ever. It has 360° lighting around the mirror and has a plus 5x magnification on one side. This is absolutely fantastic and so helpful, especially when you're doing your brows. I store cotton wool pads in a beautifully simple glass sweet-style jar, that I picked up from a local craft shop for a couple of pounds. I've decorated with a bit of lace around the top as an extra little touch to make it even prettier. My makeup brushes are kept in this cute little metal pot from Paperchase. I know some people like having the different types of brush separate (e.g. one pot for face and one for eyes) but I personally like having them all in one place and I have a larger pot to accommodate this. It's just personal preference I guess, and you should go with whatever works best for you. All of my 'base products' (foundations, concealers, BB creams, powders, primers etc, along with my miracle complexion sponge) are stored in a lovely little vintage tin I brought from an antiques centre a while back. This beautiful heart-shaped glass jar is home to the most used products in my lipstick collection. It has a lovely lid (as you can see in the photo showing an overview of the dressing table) and it's so handy as so many products can fit in so I can have all my favourite lipsticks in one place. I store all of my mascaras, eyeliners and eyebrow pencils in these two gorgeous tea light holders I picked up at another antiques centre not that long ago. 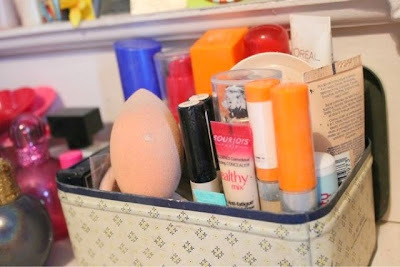 I have quite a few mascaras but storing them this way means that they're nice and tucked away yet easily accessible. To store all of my other lip products (lip glosses, balms, tints etc) I have this cute little watering can style pot that I picked up for around £2 at an antiques centre. I apologise for the horrendous state some of these products are in; they take most of the hit from excess powder when I apply it each day so they get rather grubby. This final pot is home to all the other makeup odds and ends. 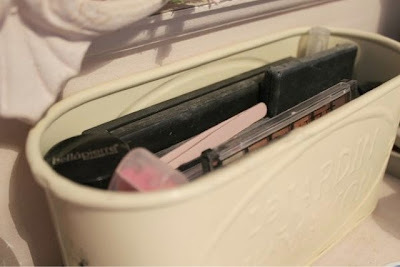 I use it to store my palettes and other eye shadows as well as tools like tweezers, sharpeners and all that jazz. 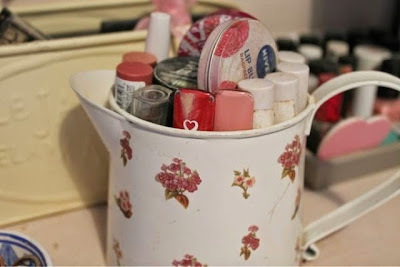 The pot itself is supposed to be some sorts of gardening storage, I do believe, but I found it in an antiques centre and thought it would make a really good way of storing makeup. It also has some french writing on it, which gives it a bit of a boutique feel I think. The other part of my dressing table I wanted to show you is my mirror. I'm actually extremely proud of how I've decorated this mirror and a lot of thought and pinterest inspiration has gone into achieving the overall look. I found a gorgeous flower garland in a garden centre catalogue (I do believe you can get lovely alternatives in Sass and Belle) and I threaded it around the mirror, getting into all of the little nooks and crannies, to give the mirror a vintage floral theme. I then found a pink beaded garland in Sass and Belle and threaded that around too. At the top of the mirror I've hung a cute little wooden plaque from Sass and Belle, bearing the words "Reach For The Stars" (if reading those words make you start singing the S Club 7 song, we can be friends). It was only £1.75 which is such a bargain for something so cute. On the right, I have a christmas tree decoration from Sass and Belle. I know it's June but it's just so cute that I couldn't bear taking it down in January. To the left of it, I've hung these stunning dainty little ballet shoes that I've had since I was really little. Towards the lower end of the mirror on the left hand side, I hang this lovely heart decoration with a map print. I found this for a couple of pounds at a tiny vintage fair in a seaside town in Yorkshire and I just think it's so cute. Slightly lower down, I have yet another Sass and Belle purchase. 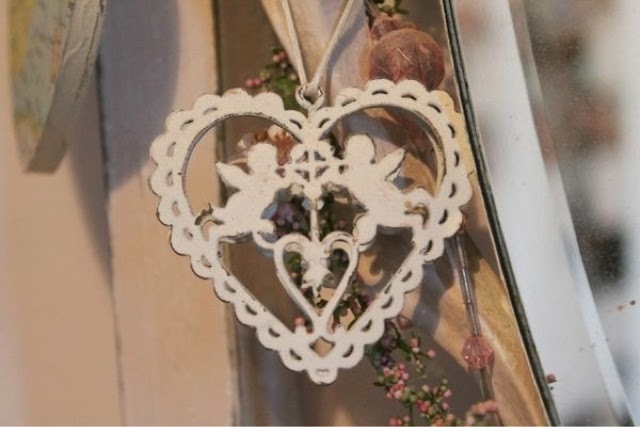 I think this may actually also be a christmas decoration but I think it's got a really shabby chic feel and is really well suited to my dressing table. 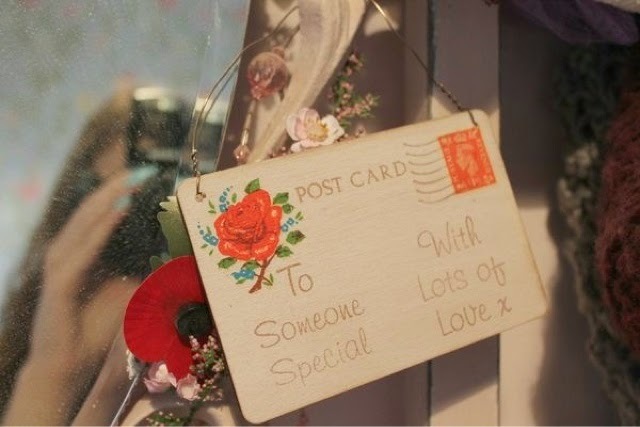 On the opposite side I have this beautiful wooden postcard decoration. I picked this up in Sass and Belle during the #SEBloggers Meet Up back in April and it got a lot of compliments from the girls, which is always nice. So that's my dressing table tour! 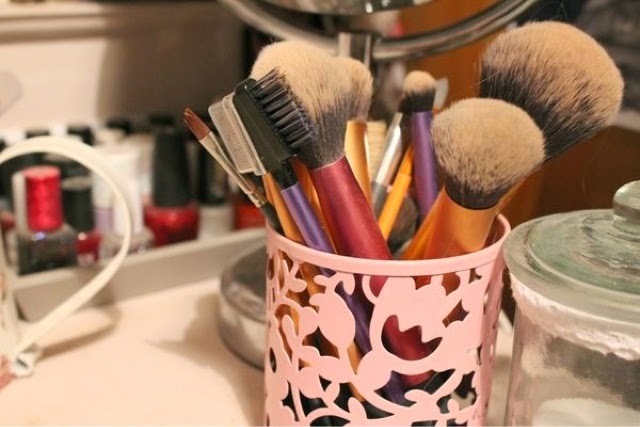 Hopefully this post will give you a bit of inspiration for your dressing table or how your organise your makeup collection. Let me know if you used any of the ideas I showed or if you have any tips on storing makeup. I love reading posts like this so if you've done one in the past, let me know and I'll have a nosey. 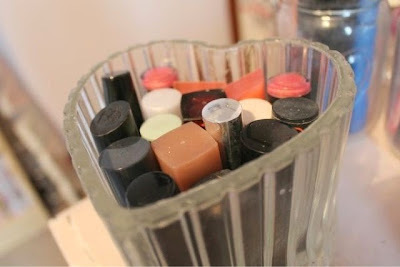 love your dressing table :) lovely little touches you have added.